At 25, I was living on Race Street in a high-rise loft, spending a lot of time in the kitchen slicing off the tips of my fingers. It’s a period of time I like to call Fish University because I was obsessed––completely obsessed––with fish cookery. This was before culinary school or the restaurant, so I was studying cookbooks like they were textbooks. When I wasn’t sprawled out on the kitchen floor getting busy with Mark Bittman and Alton Brown, I was geeking out with turbot, snapper, salmon, halibut, haddock, anything I could get my hands on. Friends and family pleaded for me to end the madness but I soldiered on. To hell with them. I would learn how to cook fish even if it meant mercury poisoning and slow, painful deaths for us all. 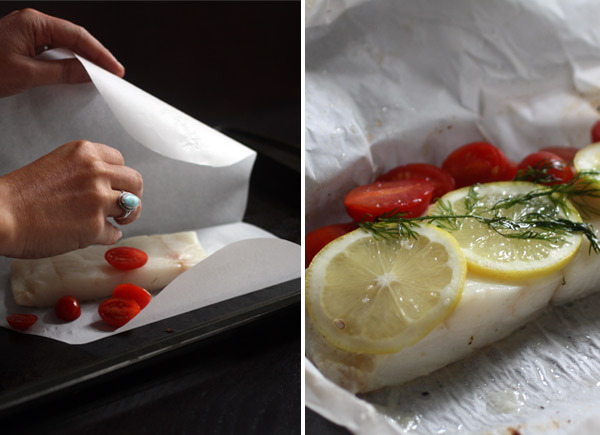 One of my earliest successes was fish “en papillote,” or “in paper.” This is, of course, fish and other aromatics wrapped in parchment paper and steamed in the oven. I loved how it turned out moist, perfectly tender fish. But most of all, I loved the theatrics at the dinner table. The moment everyone opened up their packages. Here’s what to expect: a violent wave of seriously pissed-off steam. A fish facial. Then, the kinder, gentler smells of lemon, herbs and garlic. But never mind these things, because this is what you’ve come for: the juice. Juice from the fish, from the tomatoes, from the lemon, from the white wine. Together, swirling in a pool. Dripping down your chin, soaking your shirtsleeve, making a mess of the table. I’ll admit, my fish education is still far from over. I still fool around with Mark Bittman on the kitchen floor every now and again. (He’s every bit as good as they say.) But my husband’s cool with it. He never did get mercury poisoning. And even if he had, he’d still request this dish. It’s that hot. This recipe is adapted from Mark Bittman’s Fish, who uses pine nuts and basil, which would also be great. The key here is that you can throw anything into the parchment package and steam it –– from carrots to potatoes –– so just let your hair down and have fun with it. Preheat the oven to 400 degrees. Season the fish with salt and pepper. Fold a piece of parchment paper in half, then use scissors to create a half heart shape, starting out at the bottom of the folded edge and working your way to the top. 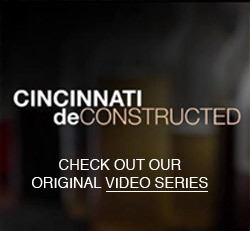 (For more directions on this, watch this video.) 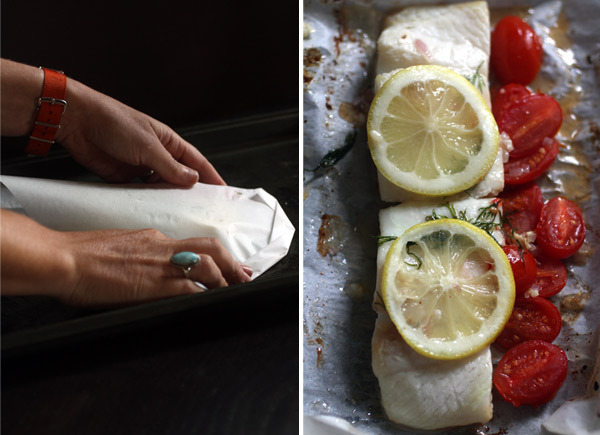 Lay your fish on one side of the fold, then top with garlic, shallots, lemon, and dill. Spoon tomatoes next to the fish and season with salt. Drizzle fish and tomatoes with olive oil. Sprinkle the fish with white wine. Fold the parchment paper over so that it forms a pouch, then crease the edges shut. Repeat this process for the remaining pieces of fish. Set the pouches on a baking sheet and bake for 30 minutes. The turbot should be white, opaque, and tender when done. I really enjoy your blog. The writing, pictures and recipes are all delightful. Well done! How very kind of you, Erin. Still funny, but very sassy. You could serve that meal any Sunday you care. Keep cooking. Keep writing. Glad to see you’re writing again. I always look forward to new posts. My husband had a similar recipe, although a bit more rustic, on a fishing trip in Canada many years ago. I still make it to this day, it’s 1 of our favorites. I like to use italian stewed tomatoes sometimes, for little extra flavor and juice.